The TDE songstress debuted the song for a small crowd in New York last night. Last night, SZA performed at an intimate show in New York ahead of her appearance on Kimmel Thursday night. During the set, the TDE vocalist led fans through some new material, including a collaboration with Travis Scott, "Love Galore." 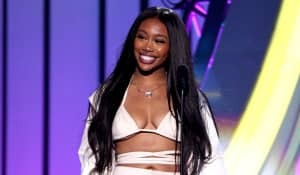 Today, a few fan-sourced videos of SZA performing the song surfaced, including a clip of her singing along to Travis' vocal part. Below, watch a few other highlights from the show, including a FADER-captured clip of her performing another new song. In related news, SZA's long-awaited full-length debut is apparently on the way soon, according to TDE. 👀 @sza performing new music live in NYC. Peep more from her show on our snap.